There are plenty of parts in your ATV that make it the fun and functional vehicle you love to ride. The shocks are perhaps one of the most important parts of any vehicle. While they are an important part of an ATV, many riders don't know how shocks work. Let's take a closer look at how shocks work so you can understand this crucial part of your ATV. While people think of a shock as one thing, shocks are actually several components or parts working together. Most ATV shocks use a reservoir with oil to resist compression of the suspension. The oil reservoir can either be inside the shock in what's called a monotube design or it can be a separate reservoir. The spring of the system coils cover the shocks and aids in compression while also helping to push the suspension back to the original position. There are also shock absorbers or dampeners placed next to the spring which play a role. These elements of oil and spring work together to compress impacts from shocks and vibrations to safeguard the vehicle from damages while providing a smoother ride. This is done by the way the shock compresses and expands again with the help of the oil and spring. 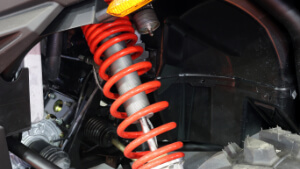 Many people think of shocks as absorbing the energy of hitting a bump, but they really compress the energy in the spring and release it as the vehicle comes back up over a bump. The shocks work very quickly when hitting a bump to take the energy and release it without you noticing anything other than the fact you went over a bump. The dampeners or absorbers help add resistance to the movement of the springs which helps with the distribution of the energy by turning some of it into heat and releasing it. All of these parts work together to make shocks work for your ATV or any vehicle using shocks. Many shocks can be adjusted to get a better ride in most models. This is called adjusting the preload setting which changes how compressed the springs and shocks get when hitting bumps. Many modern machines offer the ability to adjust this aspect, so you can fine tune how your shocks work based on your comfort preferences.